SAN MATEO, Calif. (CN) – The gate across Martins Beach Road about 7 miles south of Half Moon Bay on a picturesque stretch of the California coastline remains closed with No Trespassing signs clearly posted – despite a court order to open the gate so people can access the nearby beach. And on a characteristically sunny Sunday, many people have come, simply ignoring the signs on a gate that has spawned several lawsuits in a fight that pits coastal access for the public against advocates for private property rights. 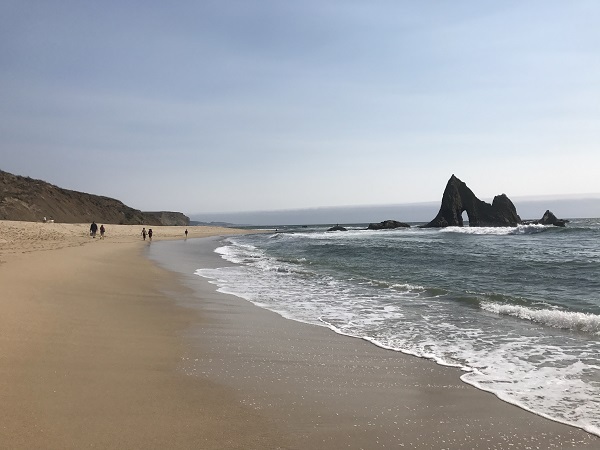 “This is my childhood beach,” said Byanca Munoz, who grew up coming to Martins Beach with her family from the Central Valley city of Modesto. Now that Munoz has moved to San Francisco, she comes to Martins Beach often, whether to enjoy the views of the Pacific Ocean and the unique rock outcroppings distinctive of this beach and the region or, more recently, to exercise her public access rights. The road Munoz and others walked on is owned by Vinod Khosla, a billionaire co-founder of Sun Microsystems, who purchased the property in 2008. He charged people a nominal fee to access the beach for less than a year before he put up a gate with a remote-control lock and painted over the billboard that advertised beach access. 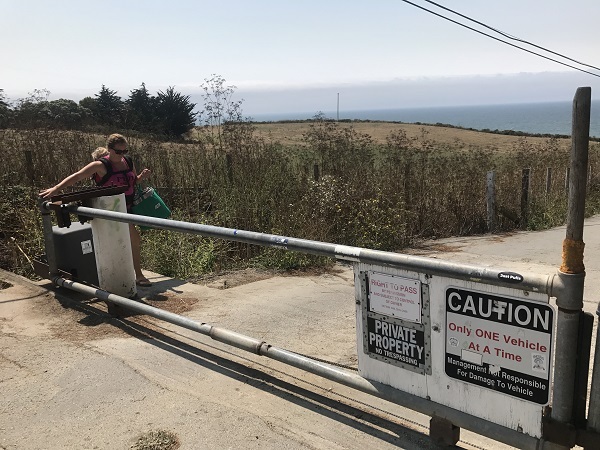 Khosla, owner of Martins Beach LLC, insists he owns the road that leads down to several cabins that front the beach and can open and shut the gate at his discretion – a practice he said was employed by the previous owners of the property. Munoz and others don’t remember it that way, saying Martins Beach had been open to the public before the billionaire purchased the property. Surfrider Foundation sued Martins Beach LLC, saying closure of the gates required a development permit from the California Coastal Commission and was a violation of the Coastal Act that requires public access to the coast. The case is still pending, but an appellate court recently held that the gate must remain open while the lower courts adjudicate the overarching issues. But as of Sunday, Khosla is in apparent defiance of the court order, as the gate was locked and several No Trespassing signs were visible from the road. The San Mateo County Sheriff’s Office has said they will not enforce trespassing violations on the property due to the nature of the ongoing litigation process. “We are responding to emergencies, but will not respond to anything related to trespassing itself while the matter is being argued,” sheriff’s spokesman Salvador Zuno said in a phone interview. Meanwhile, Joe Cotchett, a Burlingame, California-based lawyer who represents Surfrider in the litigation, said he and his team are drawing up papers to make sure Khosla opens the gate. “It is clear that Mr. Khosla is not intending to follow the court’s orders and we are going to have to go into court and enforce them,” Cotchett said in a telephone interview. Cotchett said the apparent defiance is particularly frustrating in that the recent ruling from the state appellate court specifically ordered the gate be open while the case is decided. The closed gate didn’t stop Ron of the East Bay city of Danville from wandering down to the beach and taking photos of the jagged rock formation that juts out from the ocean floor at the site. “I just walked around it,” he said. Janny Freiermuth and Laura Hamilton, who jointly run a photography business, came to the beach after reading about the high-profile dust-up between the Silicon Valley billionaire and the state of California in the local newspapers. “It’s an amazing beach,” Hamilton said. Not everyone who was at the beach was uniformly for public access, though, as a pair of fisherman working the northern end of the beach said honoring private property rights is important. “If I am walking down that road and someone tells me I can’t be there, I’ll just turn around,” said one of the fisherman, who declined to provide his name. With several pending cases in state and federal courts and a likely attempt by Surfrider Foundation to ask a judge to hold Khosla in contempt, the parties aren’t likely to work something out any time soon.